Does your stomach turn over at the thought of eating fruit and vegetables? 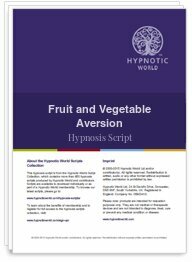 We all know that we should be eating our 5 a day portion of fruit and vegetables but if you have an aversion to them then how do you overcome it? An aversion to fruit and/or vegetables can be created in childhood; perhaps your parents never enjoyed them so you weren't given the opportunity to experience the delicious tastes that nature offers in abundance. Or maybe you discovered a creepy-crawly in your salad, fruit or vegetables? Whatever the reason, times have changed and past experiences should not stop you from enjoying the food that is good for you. The good news is that if you can be negatively hypnotized then you can also be positively hypnotized. This powerful hypnosis download MP3 uses rich imagery (which is the language of the brain) to help instil in you a strong desire to try (and enjoy) the food that nature has provided for human survival. Before too long you (or your client) will be looking forward to munching that apple/pear or other fruit, or devouring that delicious plateful of broccoli, Brussel sprouts or other greens.